Trees in the white oak section all have rounded lobe ends, and are all deciduous. They all bear acorns in a single year, and acorns have knobbed cups. Despite the fact that they can all hybridize, the species themselves tend to have markedly different habitat requirements. Blue oaks have shallow lobes, when lobes are present at all, and generally live on dry hillsides, often with southern exposure. Generally speaking, blue oaks are intolerant of summer water. Valley oaks tend to live in valley bottoms, as the name implies. They are somewhat tolerant of limited summer water. Both blue oak and valley oak occur as solitary trees or in groups in the North Bay. Garry (or Oregon white) oaks tend to occur primarily in woodlands on north-facing slopes. 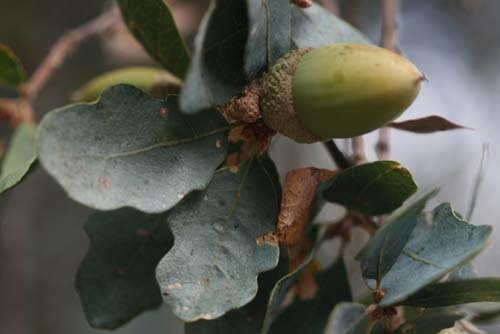 Telling Garry oak from valley oak can be challenging, but in general garry oak has a fatter acorn and narrow sinuses (the spaces between leaf lobes) than valley oaks. 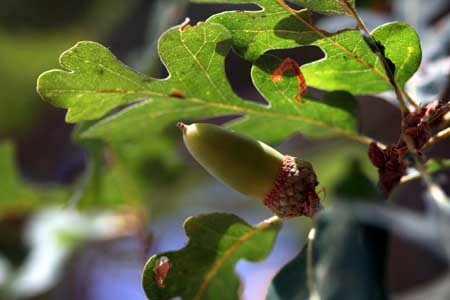 Valley oaks tend to have long, narrow very pointed acorns and broad leaf sinuses. All trees from this section are functionally resistant to sudden oak death. Quercus douglasii: Blue Oak. A deciduous tree typically 20-60 feet tall, with grey-brown checkered trunk bark. Leaves: blade 1.5-2.25 inches long, oval, tip rounded, margins wavy or slightly lobed, upper surface a powdery blue-green. Acorns: mature in 1 year, oval in cross-section with a slightly pointed tip. Acorn cup is shallow, wider than deep, and knobby, shell not wooly inside. Don’t assume that a blue oak is dead just because it has no leaves in mid-summer, especially when rainfall has been below average. Blue oaks are highly adapted to drought conditions, often dropping their leaves before summer’s end. In severe cases they may not leaf out at all, but will return in full glory after the rains have returned. 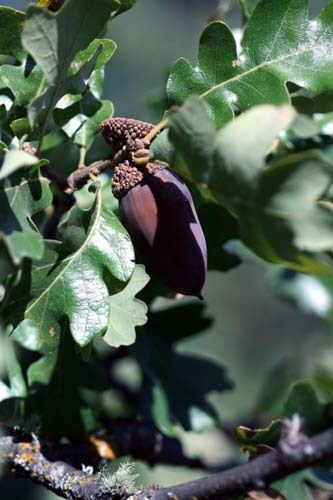 Quercus lobata: Valley Oak, Roble. A deciduous tree of any size up to about 100 feet tall, with deeply checkered grey-brown bark. Leaves: blade 2-5 inches long, with 6-10 deep lobes with very rounded ends, large sinuses (spaces between lobes). Upper surface somewhat shiny, lower surface pale green with fine hairs. Acorns: mature in 1 year, long and conical in shape, with a pointed tip. Acorn cup often as wide as deep, and typically very knobby, acorn shell not wooly inside. Quercus garryana: Oregon White Oak. A deciduous tree typically 25-65 feet tall with thin, ridged, greyish-brown bark. Leaves: blade 2-7 inches long, with 5-7 lobes, lobe ends slightly pointed, sinuses (area between lobes on leaf) narrow compared to valley oak. Upper leaf surface glossy and somewhat smooth, lower surface dull light green, usually with fine hairs. Acorns: mature in 1 year, oval to almost spherical in cross section with a rounded tip. Acorn cup shallow, wider than deep, and slightly knobby, acorn shell not wooly inside.